SAVE MONEY, SAVE TIME, USE A RUKKNET GOLF NET! 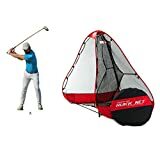 RukkNet Pop-Up Golf Net (10ft x 7ft x 5ft)Get more out of your time at the driving range by practicing with this fast and innovative solution for practicing inside or outside your home!HIGH QUALITY, STRONG MATERIALBuilt of quality materials' including a thick inside netting for catching the most powerful drives! There is a reason this net was voted a top new release by Golf Digest at the 2013 PGA Golf Show and continues as a best selling golf net on Amazon.com.USE REAL GOLF BALLS AND ALL YOUR CLUBSA full 10 feet wide at the base and extending up to 7 ft. tall the net can be used with all clubs in your bag. The net features a carbon steel frame that pops it open instantly, no setup required. To fold, follow the full color instructions sewn into the bag or use our online video instructions. The design incorporates a large handle and clearly marked reference points for stowage in a durable carry case. Hit driver, to iron shots, to wedge shots and anything in between!PRACTICE TOO MUCH? NO SUCH THING ANYMORE!The tough and fully replaceable inside net catches and gently returns the ball to the player after each swing. Double-layered base for use on rough concrete surfaces, the net also includes stakes for outdoor use. A well-built and high quality pop up net that is unmatched by copycats or rivals!USA OWNED AND OPERATEDRukket is US owned and operated and offers US customer service representatives to answer any questions.SAVE MONEY, SAVE TIME, USE A RUKKET GOLF NET!